Graymoor Spiritual Life Center in New York has this year sponsored Saturday morning Lenten retreats based on the life and ministry of contemporary spiritual leaders. I was asked to introduce the Franciscan Sister, Thea Bowman, to one of the Saturday morning retreats. I did so gratefully. I first encountered Thea when she was a new member of the US Bishops’ National Advisory Council; I was serving as staff to the Council. The weekend meetings typically opened with a late Friday afternoon Mass, which was basically a no-frills affair. The Council members (bishops, religious, laity and priests) plus the staff dutifully sang the hymns, an exercise in responsibility more than passionate devotion. This particular Friday, out of nowhere, came a piercing note which seemed to go on for a very long time, followed by rhythm and harmony that caught on with other members of the congregation. Thea had nudged us all into a worshipping community where we actually enjoyed the presence of God. It was an unforgettable introduction to an unforgettable woman. Over the years I came to know and appreciate Thea’s many layered giftedness: her natural beauty, her musical talent, her brilliant mind, her knowledge of western history and literature and her claiming of her African-American heritage. She wove everything together and out of rich diversity made a unique spiritual pathway open to all. And then cancer entered her life, and in that time of suffering and diminishment, new aspects of her ministry emerged. She was asked how she would explain suffering and responded, “I can’t explain it.” Did she ever despair one interviewer wanted to know. ”What for?” she asked. Her words became ever more direct and unencumbered, her trust as strong as steel. ”I’m going to live until I die,” she said. She spoke of being a woman in the church. To the bishops she observed, ”You say we can’t preach in church—but we preach everywhere else: in the family, in hospitals, in schools, in the workplace, in jails, on streetcorners—everywhere but church” Her plain, simple truth highlighted the incongruity of the situation. As this month for remembering women’s history comes to a close I am pondering both Thea and Fatima. And some questions won’t go away. Why can Catholic women preach everywhere but in church? I’m looking for the real reason not the official one. Is religion used, not only in rural areas, but everywhere, to reinforce bias, including institutional bias? Is this conscious or unconscious? And an old lingering question: Are men afraid of women? If so, why? Thank you for this post, Dolores. 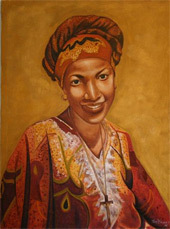 I didn't know about Thea Bowman, and followed the link. Her American-ness reminds me of the native American Franciscan sister, Sr. Jose Hobday, and how much these women have contributed to Catholicism in America. I also appreciate very much your direct and probing questions about just what is it about religion that so wants to keep women under control. Like you, I have long suspected that men are afraid of women, and I suspect it has something (everything) to do with deep and primal sexual energies and fears. I believe that if the Catholic Church could open its eyes to the gifts and voices of women, not just on the street corner but also in the church, many of its sexual confusions and sins would heal and resolve themselves. I do not know if this means that women should be ordained or not, but I do sense that women do not fully know their own importance and worth within the Church, nor does the hierarchy recognize their deep need for women at all levels of ministry. Perhaps part of the problem is the supposed spiritual "power" that is given to a priest. To forgive sins. To change bread and wine into the body and blood of Jesus. Whereas a woman gives birth to human life. Mary was the mother of God (if you can wrap your mind around such a concept).